A repeat I know, but I thought you’d all like to get a second nosey at my ugly mug being humiliated on Redwolf TV. Whilst on holiday in HK I was asked to pay a visit to Red Wolf Airsoft’s Headquarters. I didn’t quite expect a full Top Gear-esque interview and challenge – especially with a pistol I’ve never used before in a climate I’m unfamiliar with and with a whole other arsenal of excuses to boot, but…Hey, just watch the video. Embarrassing, yes, but it speaks for itself really. 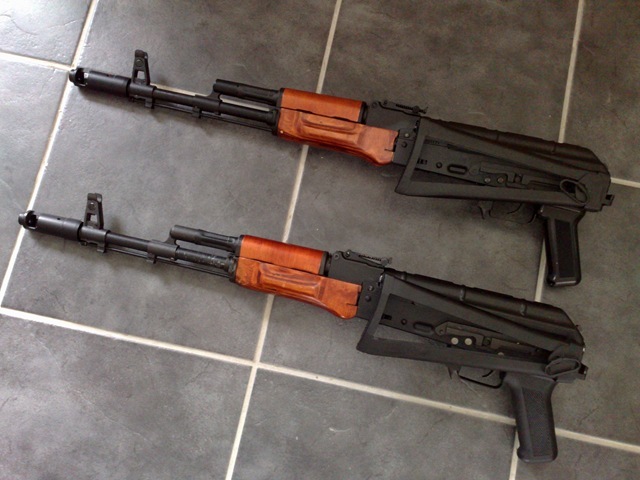 I also bought a GHK AKS74 whilst at their HQ – I couldn’t resist, with them lying around. The review can be found here. While on my recent visit to Redwolf in Hong Kong, as unfortunately chronicled here, I was lucky enough to be shown around. One of the main things that caught my eye was some of the first of the freshly released GHK AKS74 and AK74M variants, which I covered in a recent news post. I couldn’t leave without buying one of them, and with my recent love of all things Afghan War era, it had to be the AKS74 I went for! To make things more interesting I compared the GHK AKS74 to the Dboys Variant upon which its externals are based. There’s been a lot of speculation over the Association of British Airsoft (AOBA), the latest in a series of UK airsoft organisations to spring up in the wake of the Violent Crime Reduction Act, after a number of people wandered across its website address. Your association is brought to you by airsofters like yourself. The Association of British Airsoft is run by players, for the players; the non-profit organisations main aim being to bring benefits to Airsoft players; whilst also educating the public and promoting the sport as a whole. Membership with the AOBA brings a whole host of benefits for players, including full and comprehensive personal insurance, all members will be provided with an authentic registration card that will allow you to avail yourself of the VCRA defence and permit you to buy RIF’s. Also available is free legal advice to any player who finds themselves needing it. We are working closely with retailers to provide tangible benefits to members with guaranteed high discounts to all members, and we want to get game site’s involved and both listening to and working with you the players. We are the first group set up purely for the benefit & promotion of the players and the sport. Pre registration is free to join and we want to give players the opportunity to have their comments heard but more importantly listened to. The Association of British Airsoft will be working with individual players as well as Teams, Game Site’s and Retailers. Our aim is to provide a voice for the players first and foremost because without you in the field playing our wonderful sport there simply is no Airsoft. We are sure you have many questions and queries and we ask anyone who does have questions to forward them to us with the corresponding email address to obtain the correct information. We want to reduce as much unnecessary forum speculation/rumours. We have made our website public to show you the players that we are here and on the way. It will take some time to become fully established and we ask if you have any ideas or suggestions or feedback however constructive, to contact us directly. Please note our constitution will be available shortly. In association with conflictzone-airsoft.co.uk and by kind permission of Mr & Mrs Parry, we are proud to present- THE BATTLE OF DAWES HILL! The event will be held on the 19th & 20th of September and all proceeds from this event will be donated to the Help For Heroes charity. The 2 day event comprises of missions in woodland areas and in specially constructed night game arenas, featuring special effects from TLSFX events team. The setting is a varied site, in the shadow of Rampisham Down Radio Station in Dorset. The area incorporates – deep woodland, saplings, tall trees clearings, many natural and man made defences and an open "no mans land" area for night game which be filled with various obstacles. Two opposing teams will fight for control of the woods whilst simultaneously completing missions to gather information & missiles to eliminate the enemy. non combatant actors will be in action throughout the weekend to add extra realism to the event. For more information view the event’s website.